Last week I cooked miso soup with white eggplants from the garden. It was so simple yet tasty! Here is the recipe using dashi powder, which is a bit of a cheat but handy to have when I don’t have konbu & bonito flakes! I used the dashi powder without additives. – 2-3 small eggplants, sliced into 5mm thick and soak in salty water for 10 min and drain. – Add eggplants to a pan of 750ml water, bring to simmer and cook until eggplants are slightly soft. 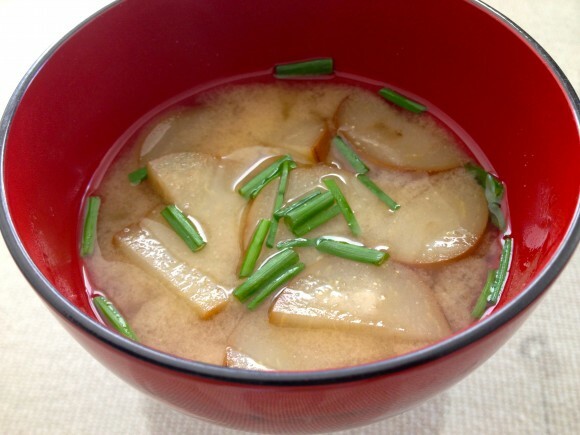 – Add 5g of dashi powder to the pan and keep gentle simmer (do not to boil). – When eggplants are soft enough to your taste, dissolve approx. 2 Tbsp of miso paste (or to your taste) through a strainer into the pan (I used the white miso paste). – Turn off the heat and serve into a bowl, garnish with chopped chives, also from the garden. Then here is a great recipe of Peppered Leek & Zucchini mini muffins by our volunteer Trisha Haly who brought her yummy creations to our Sunday tea break on more than one occasion. Thanks Trisha for your contribution! Grease 24 hole mini muffin pan. Heat oil in frying pan, add leek, zucchini and garlic, cook, stirring, until leek is soft and any liquid evaporated. Strain mixture, press out excess liquid; cool. Sift flour, curry powder and spices into large bowl, rub in butter, then cheese, stir zucchini mixture with eggs, buttermilk and extra oil and add to dry ingredients. Spoon mixture into prepared pan, sprinkle with topping. Bake in moderately hot oven about 15-20 minutes. Deep fry extra leek for garnish. Topping: Combine all ingredients in small bowl; mix well.